Army Medicine (AMEDD) is comprised of a committed team of more than 140,000 professionals, who provide a continuum of integrated health services, research, training and education that supports approximately 3.8 million beneficiaries. When assessed against nationally accepted quality benchmarks for healthcare, AMEDD performance meets or exceeds the Nation’s top-performing civilian systems while sustaining readiness and engaging in operational missions across the globe. To remain successful in this environment, and face future challenges, Army Medicine looks for ways to innovate. By far, the most promising and largest initiative to bring care closer to patients is virtual health. AMEDD is a recognized leader in this area with services currently spanning 30 countries and territories, and 30 clinical specialties. Potential uses are far-reaching. From remotely monitoring patient vital signs to providing virtual consultations to a medic treating a combat casualty at the point of injury, Army Medicine is seeking ways to innovate in everything it does. It sees virtual health as a means to revolutionize access whether in garrison facilities, at our patients’ homes or at the point of injury. Imagine this scenario: In the middle of the night in a remote location, a Soldier arrives at a makeshift aid station with a leg wound. The femoral artery is damaged. The physician assistant (PA) has some tools to control the bleeding – junctional and limb tourniquets – but no access to whole blood. This Soldier would typically be evacuated to a surgical team, but right now that is not possible. Weather conditions, distance, availability of transportation or enemy fire are factors that might prevent a medical evacuation. In this case, it is all four. The PA has no choice but to hold the Soldier right where he is. It will be at least 24 hours before an evacuation can take place, and the wounded Soldier may bleed to death. However, the PA has a tool – virtual health. She puts on a pair of augmented reality glasses and connects to a surgeon 3,000 miles away, thus allowing the surgeon to visualize and assess the medical situation. The surgeon shows the PA how to perform a procedure to gain maximum control of the bleeding by placing his hands into the PA’s field of vision and marking on screen where incisions should be made. Throughout the procedure, the surgeon mentors the PA and talks her through the procedure, seeing every step of the process through advanced clinical video-teleconferencing. The Soldier is evacuated 24 hours later and reaches a surgical team. He survives. This scenario is not happening yet, but it will – and soon – as ongoing pilots build capability in the field. In the interim, virtual healthcare using other modalities is connecting clinicians in garrison to their colleagues downrange for support. It is also connecting garrison specialists to the PA or combat medic no matter where they are in the world. And this capability will be increasingly critical to ensure Soldiers with survivable wounds make it home. Army Medicine takes great pride and has an intense commitment to its no-fail mission of battlefield medicine. Army combat medics are highly trained. MEDEVAC helicopters and ground transportation vehicles are poised and ready to respond to the urgency of the mission. And medical capabilities, including forward surgical teams, are postured as far forward as possible. Today if a wounded Service Member reaches the forward surgical team with potentially survivable wounds, the actual survival rate is nearly 100 percent. However, the battlefield is changing. The operating environment may not allow evacuation of a seriously injured Service Member at will in the near future. A new concept, the multi-domain battle, is emerging with a new set of challenges to overcome during the next 25 to 30 years. This concept describes how U.S. ground forces, as part of joint and multinational teams, is expected to operate against highly capable enemies. The multi-domain battle includes elements of traditional ground, sea and air warfare but also space and cyberspace. To support the entire range of Army medical readiness in a multi-domain battle environment, AMEDD has identified four lines of effort as part of the 2017 Army Medicine Campaign Plan: (1) readiness and health of all active duty personnel; (2) development of medical capabilities to support the force; (3) healthcare delivery to its forces wherever they are; and (4) care of the entire military family, including Soldiers for Life, civilians and families. Although AMEDD’s privilege and responsibility to care for U.S. Army retirees and other beneficiaries is enduring, it is the first three items that directly relate to keeping the Army fit and ready to fight. But in the multi-domain battlefield, how will it provide medical support to small groups of service personnel who may be operating far from large units with significant medical support? How will it provide care to wounded when MEDEVAC is not possible for 24–72 hours because the U.S. military does not have air superiority? How can the skills of a specialist at a stateside medical center reach the deployed medic? A key part of the answer is virtual health. Virtual health uses technology to connect patients with healthcare providers, and providers with each other, across geography and time. Distance is no barrier; five miles or 500 miles are the same distance in virtual health. Time is no longer a barrier either. Since Army Medicine is deployed around the world, someone is always awake and ready to support the mission, regardless of local time. The Army has been using virtual health since the 1990s. For example, the ability to send digital radiology or dermatology images across long distances to allow a specialist to read and interpret has existed for more than a decade. As another example, AMEDD operates three global tele-behavioral health hubs strategically located throughout the world to provide care 24/7, if needed, by covering time zones. Army Medicine offers clinical services across 18 time zones to patients in more than 30 countries and territories in 30 clinical specialties. Virtual health is available today to support health services from echelon I through IV. This technology already improves readiness, access and quality of care by leveraging available medical capacity and providing care worldwide. 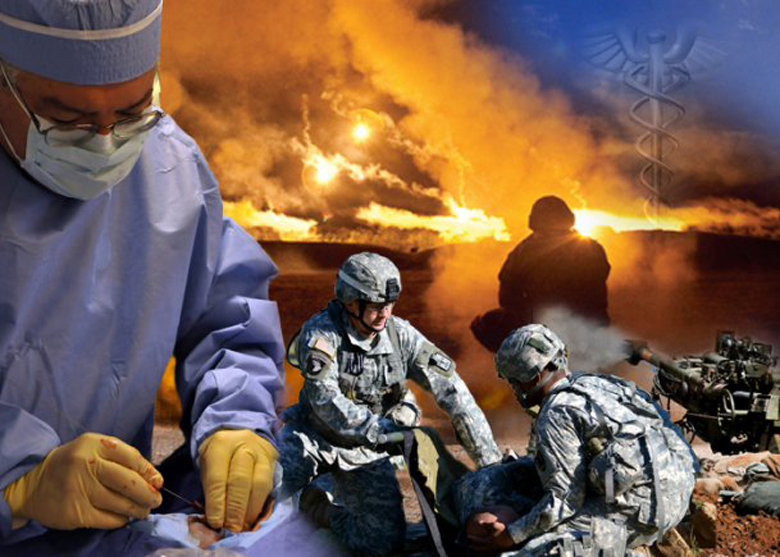 By expanding use of virtual health innovations, especially for deployed Soldiers in all environments and across the range of military operations, Army Medicine can save lives and support combat wounded at all key medical treatment and evacuation nodes on the modern battlefield. One of the first steps in expansion was establishment of a Virtual Medical Center (VMC). In April 2017, Army Medicine announced a VMC at Brooke Army Medical Center in San Antonio, Texas. It will serve as the organizational structure by which providers deliver virtual health services using new tools in both garrison and deployed settings across all roles of care. Once developed, the VMC will be the tactical hub of virtual health for the Army. It will implement innovations for the enterprise and synchronize the good work in virtual health across AMEDD. As it reaches out to deployed Service Members, the VMC will help in the current fight by connecting subspecialty expertise in garrison to Soldiers in combat zones. It will also be a key element of the future fight, as air superiority is challenged, medical evacuations become scarce and expertise is needed to keep wounded Soldiers alive and well for longer periods of time. Although the VMC is a relatively new concept, it builds on Army Medicine’s previous 20 years of experience. By implementing virtual health innovations for deployed Soldiers in all environments and across the range of military operations, AMEDD can improve battlefield medical capabilities. An example of how virtual health is being implemented is the program at Blanchfield Army Community Hospital (BACH) at Fort Campbell, Kentucky. The BACH Virtual Health Program was established Sept. 2016 as part of the BACH Commander’s Strategic Initiative to improve access to care and to identify new modalities of care delivery. The program has four distinct lines of effort with participation from 10 departments throughout the hospital. Lines of effort include audio appointments, virtual health to the patient’s location (e.g. homes, including primary care, pediatrics, public health nursing and the Community Care Unit at the Warrior Transition Barracks) and virtual health specialty consultations (for example, tele-endocrinology). The BACH virtual health team coordinated efforts with the 5th Special Forces Group, Dwight D. Eisenhower Army Medical Center, BAMC, Walter Reed National Military Medical Center, Regional Health Command–Europe and the Telemedicine and Advanced Technology Research Center to develop clinical workflow processes, standard operating procedures and overall understanding of requirements necessary to build a successful MTF-level virtual health program. Their programs are helping others, including the VMC, to develop programs for the future. Another example is the multi-specialty telemedicine program in Europe, which includes a thriving program as well as the Virtual Integrated Patient Readiness & Remote Care (VIPPR) Clinic. In particular, the VIPPR Clinic at Germany’s Landstuhl Regional Medical Center provides readiness and other medical services to Army, Air Force and Navy personnel remotely located and without organic medical support across Europe, the Middle East and Africa, and it includes those assigned to the North Atlantic Treaty Organization (NATO). Staffed by a physician assistant, exercise physiologist and support staff, the clinic can perform virtual visits with active duty medics and their patients providing a wide variety of readiness services. These include, but are not limited to, Periodic Health Assessments (PHAs), Post Deployment Health Assessments (PDHAs), Post Deployment Health Reassessments (PDHRAs) and dental updates. The VIPPR Clinic was instrumental in helping U.S. military personnel assigned to NATO improve medical readiness from 77 percent to 83 percent. Pacific Asynchronous TeleHealth (PATH) has been a long-time, favorite program of clinicians in Army Medicine. PATH is a web-based, HIPAA-compliant platform used for provider-to-provider teleconsultation and, when required, aeromedical evacuation case management. Hosted at Tripler Army Medical Center (TAMC), PATH enables remote providers to submit patient demographics, clinical data and supplementary multimedia as dictated by the clinical scenario. Consultations are screened by physician managers at TAMC and forwarded to appropriate specialists for input. If a specialist is not available at TAMC, other Department of Defense (DoD) providers can “electronically backfill” and provide consultative expertise as needed. One virtual health use moving ahead of all others is mental health counseling. Improving access to mental health via virtual health has been enormously successful. In Fiscal Year 2016, more than 40,000 virtual health encounters occurred in Army Medicine. About 80 percent were for mental, or behavioral, health. Virtual health can be applied to almost any specialized area of medicine, and behavioral health specialists have widely adopted use of virtual appointments. While use of virtual health for any medical specialty is important, the Army recognizes that ease and convenience of behavioral health access encourages those needing care to seek it. AMEDD has vastly expanded and transformed behavioral health and now reaches Soldiers and families closer to where they work to provide open access and reduced stigma. Behavioral health delivery directly impacts readiness. All in all, virtual health is no longer a concept. It is fast becoming standard operating procedure (SOP) for improving care and saving lives. Although virtual health offers great opportunity to save lives on the battlefield, it is also transforming the way routine healthcare is delivered to Army families. The traditional visit to the doctor’s office is changing to virtual consultations via webcams, so spouses and children of Soldiers can have more convenient access to care. SOP for some virtual health exams may involve having a nurse, physician assistant or medic available to assist with collecting data for the remote physician. A virtual health or “telemedicine” cart with a special set of tools has been developed for the remote clinic, such as the VIPPR in Europe. Basic equipment on the cart includes a digital stethoscope, an otoscope to examine ears and sinuses, an ophthalmoscope to examine eyes and an exam camera. The cart also has a computer to store and transmit sounds and images. These carts will be widely available soon. The ability to be connected to healthcare providers is especially important to retirees who face increasing likelihood of chronic health issues. Virtual health is also a useful option for those needing after-hours healthcare or those away from home on business or vacation. Virtual health encounters will soon include video visits on smart phones and remote health monitoring at home for select patients receiving ongoing care. A patient can have signs and symptoms checked without leaving home or work, a significant time and cost savings. Virtual health will be an important part of healthcare delivery in the future. In July 2016, a team of about 30 senior leaders, regional chiefs, clinicians and experts from a variety of fields held a symposium to discuss expanding use in Army Medicine. A similar group meets again in 2017. The symposium discussed delivery issues, such as the importance of accurate coding for procedures in electronic health records. This will limit the number of virtual health encounters that are being undercounted due to incorrect coding. The symposium identified other factors impeding utilization of virtual health. Concerns regarding legal issues, privileging of clinical personnel and admitting privileges at medical centers are being discussed and resolved. Even with issues to solve, use of virtual health is growing and providing benefits. Physicians gain rapid access to specialists to help make decisions about care, to increase clinical efficiency and to improve potential for better patient outcomes. The number of virtual health appointments for both specialties and routine care is growing rapidly. Wounded Soldiers on the battlefield, families in garrison or at home in a rural setting and retirees need to have access to healthcare made as easy as possible. Virtual health will save lives of Soldiers and keep families healthy. Virtual health, however, has its highest potential to support the warfighter. For the combat medic on the battlefield, training to gain additional clinical skills and new tools to use virtual health will begin Fall of 2017. Virtual health will allow Army Medicine to be everywhere it is needed. It means immediate access to care anytime and from anywhere. On the battlefield, medical care is always needed immediately. Virtual health will make this possible. AMEDD lessons learned throughout the past 15 years have changed how care is delivered on the battlefield and at home. These outcomes, the many lives saved and advancements realized, do not happen by chance. They are products of a thoughtfully organized, tested and proven collection of military treatment facilities, research labs, training and education campuses similar to those that exist in Navy and Air Force components of the Joint Health Services Enterprise. They are also the result of an integrated and well-synchronized plan, as well as delivery of the right capabilities at the right time. The strength of the Army is derived from its Soldiers and, in turn, their families. Strength is not derived from a weapon or a weapons system; it is derived from people. Army Medicine is a driving force behind innovations and technologies to adapt to future challenges that may arise at home or abroad. AMEDD will continue to provide full spectrum care from point of injury or illness on a battlefield through rehabilitative care while continuing to meet or exceed national quality of care standards in garrison environments. This is Army Medicine’s sacred trust with the Nation and America’s sons and daughters. It will continue to evolve capabilities in virtual health to ensure its ability to support the Nation’s Army and Joint Force at the highest levels. 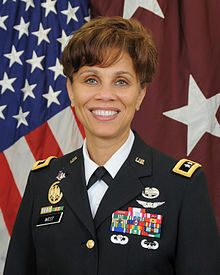 LTG Nadja Y. West, is the 44th U.S. Army Surgeon General and Commanding General, U.S. Army Medical Command. She is a graduate of the U.S. Military Academy with a B.S. in Engineering and M.D. from George Washington University School of Medicine in Washington, D.C. West serves as the Army staff medical expert, advising the Secretary of the Army, Army Chief of Staff and other Army leaders and providing guidance to field units. Her commands include six medical research laboratories; eight Army medical centers and numerous clinics in the United States, Europe, Korea and Japan; and the Army Medical Department Center and School, Health Readiness Center of Excellence. West manages a $12 billion budget and oversees care of almost 4 million eligible beneficiaries. In addition to veterinary support to all Services, she overseas engagement in joint-service efforts, to include medical unit participation in multi-service deployments and exercises. For more information, go to www.armymedicine.mil.